BlockChain in Retail : How Blockchain Will Change the Consumer Goods Supply? As everything is going digital so is the currency. We use electronic money drastically and bitcoin is the new sensation of the electronic work. Similar to bitcoin, blockchain is another undeniable resourceful invention. In fact, bitcoin and blockchain work hand in hand. Blockchain has grown extremely popular, blockchain for retail industry is the latest buzz. However, before understanding blockchain it is better to understand bitcoin. Blockchain can be described as the world’s leading platform for digital currency. So, what is the difference between bitcoin and blockchain? Though these two elements of digital currency are different, they are closely related. In simple terms when bitcoin was published as open source, blockchain was packaged in the same solution. It can be said that bitcoin was the first application of blockchain. If you ask the major blockchain service providers, they will state that bitcoin was unintentionally used to refer to blockchain. Bitcoin is a digital currency, cryptocurrency, which is based on cryptography guidelines for regulation and generation of currency units. This currency is also called as decentralized currency. These are considered as virtual coins, which has a self-contained value. This currency does not require banks to store or move money. Bitcoins are often confused with blockchain. Also Read: How Bitcoin is Empowering Mobile Casino Gaming Industry? Information about transaction on bitcoin are stored in a distributed ledger and is transferred through a peer to peer open network. While bitcoins are used for transactions, blockchain is the core technology that maintains the ledger. Blockchain can significantly influence the paradigm of retail industry. It can impact and disrupt a great range of process ranging of supply chain activities to after sales processes. Integration of blockchain in retail industry can facilitated better distribution and improved user experience through inter operable services. 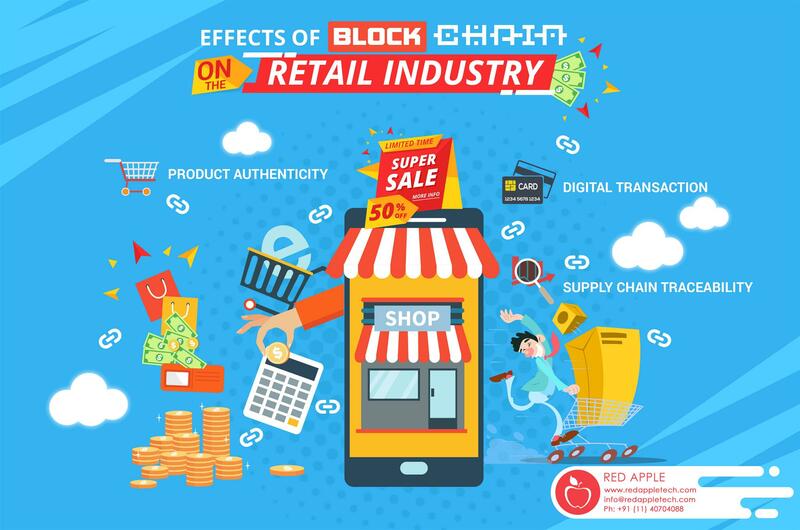 Employing blockchain application in retail industry can make trade indisputable. It may also guarantee information payload integrity. The risk of counterfeiting is mitigated and final buyer can verify all product characteristics such as provenance, components, material, and specifications. Blockchain is revising the instruments of contract and negotiations. It can sharpen the authenticity and verification mechanism of supply chain. Impact can be registered on trade instruments such as incoterms, product custom declaration, and international trade registers. Apart from enhancing trade processes and facilitating fund transfer, blockchain’s programmability as well as smart contract logic could empower loyalty programs through its smart incentive facilities. Blockchain supports tracking and authenticity proofing mechanism. This will allow customers to know and realize the history of a product. In-store purchase experience can be enriched through friction less payment as well as mobile services. Blockchain in retail industry can be helpful as it can streamline P2M transaction. It benefits both customers as well as retailer by cost-cutting technologies on payment. This in turn enhances trust and relationship between these parties. Transparency is extremely important to consumers. Blockchain technology will allow consumers to track their product with transparency. For example, consumers will be able to track their fish from boat to their home. Blockchain in retail will allow all involved parties from manufacturer, to supplier and from retailer to consumer to trace their product. Blockchain supports Block Verify which is an anti-counterfeiting solution which will help in avoiding counterfeit products. This is one of the indispensable advantages of blockchain in retail, especially for industries such as pharmaceuticals, luxury goods, and electronics. Blockchain may not need to customer to deal with the bank. It provides a reliable payment as well as ledger system which can considerably multiply sales. Warranter is a service which can transfer warranties to the cloud from papers using blockchain. These warranties remain up-to-date and can be transferred easily. A good blockchain service company can help you use blockchain. Blockchain is still not understandable to many people and it will take 12 to 18 months for people to start using blockchain. This technology when adopted will help in reducing human errors drastically. Moreover, the several benefits if blockchain such as transparency, tracking system, etc., will make transaction easier and trustworthy.